As you will soon find out, I’m kind of in love with my dogs. I also can’t go in or near a pet store without wanting to buy them some sort of prize or treat. No joke, it’s a good thing my husband can usually talk me out of it. 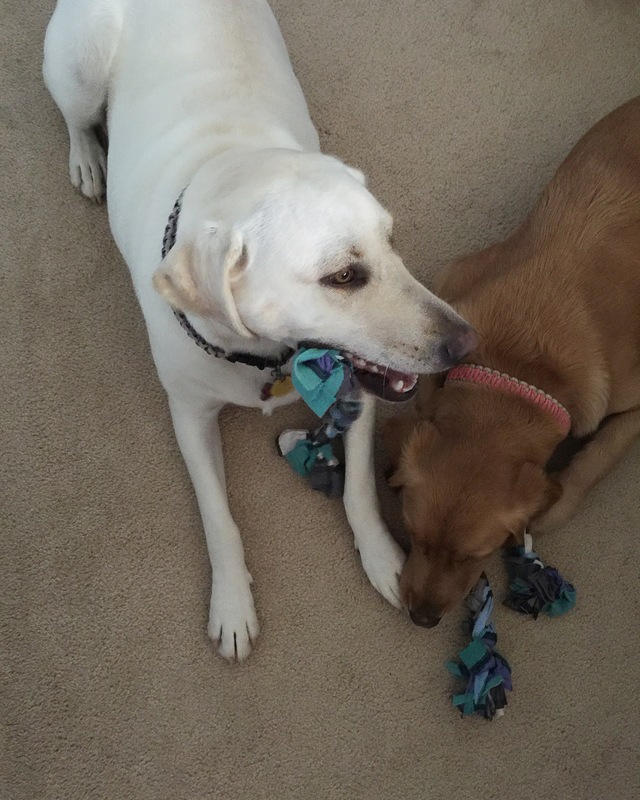 We have a Golden and Labrador Retriever and between the two of them, they destroy toys faster than I even knew possible. To be honest, I get a little bit cranky when I buy them a new toy and its torn up and dismembered within 24 hours. So, I jumped on Google and did a little research on making my own dog toys from items around the house. I came across a T-Shirt “rope” toy that seemed easy enough and would give me a way to use a few shirts I had laying around. I like to donate clothes that I just don’t wear or that don’t fit me anymore, but I only had 5 shirts and didn’t feel a trip to Goodwill was worth it for that many items. Anyway, I made these T-Shirt toys the other day and they were an instant hit with the pups! I strongly recommend anyone with a dog to make them and see for themselves!! 1. Gather together two or three of your old T-Shirts (I only used two, it all depends on how thick you want the braid). 2. Take the shirts and cut 2-3 inch strips from the bottom hem up to the top of the shirt. I cut the shirt open so it was easier to cut strips. I also had two different sizes of strips from each shirt which is why I made two ropes. 3. Gather the strips at one end and use a scrap piece of fabric to secure them. 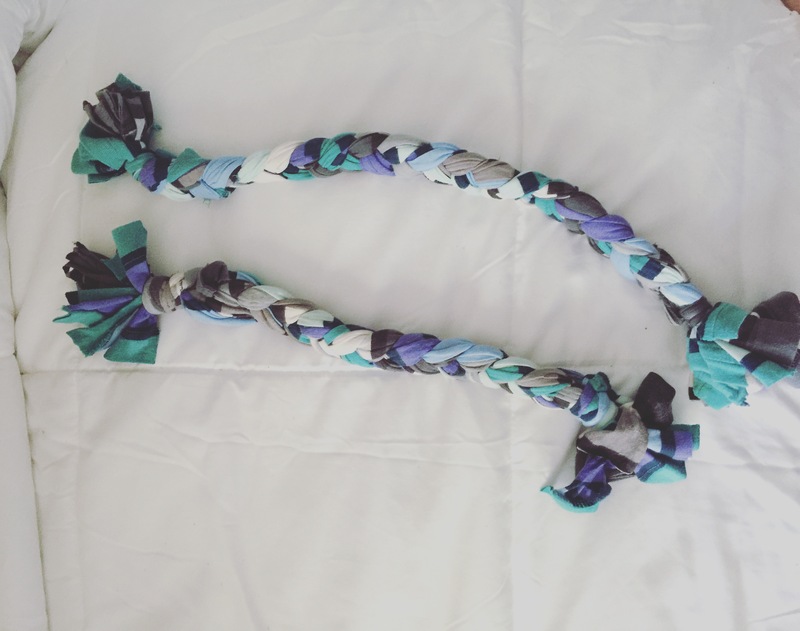 If you just wrap the scrap piece around tightly and then tie it tight, you can braid the extra at the end of the knot into the rest of the toy. 4. Then braid and secure the end with another scrap piece of fabric and viola! You are all done! I will be making another one soon and will post the step by step photos to go with it!